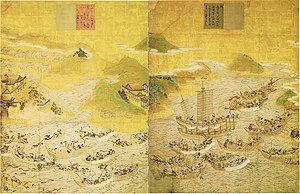 The battle of Dan-no-ura (壇ノ浦の戦い, Dan-no-ura no tatakai) was a major sea battle of the Genpei War, occurring at Dan-no-ura, in the Shimonoseki Strait off the southern tip of Honshū. On April 25, 1185, the fleet of the Minamoto clan (Genji), led by Minamoto no Yoshitsune, defeated the fleet of the Taira clan (Heike). The morning rip tide was an advantage to the Taira in the morning but turned to their disadvantage in the afternoon. The young Emperor Antoku was one of those who perished amongst the Taira nobles. The Taira were outnumbered, but some sources say that they had the advantage over the Minamoto in understanding the tides of that particular area, as well as naval combat tactics in general. The Taira split their fleet into three squadrons, while their enemy arrived en masse, their ships abreast, and archers ready. The beginning of the battle consisted mainly of a long-range archery exchange, before the Taira took the initiative, using the tides to help them try to surround the enemy ships. They engaged the Minamoto, and the archery from a distance eventually gave way to hand-to-hand combat with swords and daggers after the crews of the ships boarded each other. However, the tide changed, and the advantage was given back to the Minamoto. One of the crucial factors that allowed the Minamoto to win the battle was that a Taira general, Taguchi Shigeyoshi, defected and attacked the Taira from the rear. He also revealed to the Minamoto which ship the six-year-old Emperor Antoku was on. Their archers turned their attention to the helmsmen and rowers of the Emperor's ship, as well as the rest of their enemy's fleet, sending their ships out of control. Many of the Taira saw the battle turn against them and committed suicide. To this day, the Heike Crabs found in the Straits of Shimonoseki are considered by the Japanese to hold the spirits of the Taira warriors. The Taira attempted to toss the imperial regalia off the ship but only managed to get the sword and jewel into the water before the ship holding the regalia was captured. The jewel was recovered by divers; many presume the sword to have been lost at this time, though it is officially said to have been recovered and enshrined at Atsuta Shrine. This decisive defeat of the Taira forces led to the end of the Taira bid for control of Japan. Minamoto no Yoritomo, the elder half-brother of Minamoto Yoshitsune, became the first shōgun, establishing his military government (bakufu) in Kamakura. In this battle the Taira lost Taira Tomomori, Taira Noritsune, Taira Norimori, Taira Tsunemori, Taira Sukemori, Taira Arimori and Taira Yukimori, who were killed. In 1965, a dramatized version of the battle dated for March 24, 1185, appeared as part of the movie Kwaidan. In his book and television series Cosmos, Carl Sagan presents a brief, dramatic account of the battle in chapter/episode 2; "One Voice in the Cosmic Fugue". Sagan then uses the Heike crabs as examples of artificial selection. In the anime film Pom Poko, by Studio Ghibli, one of the venerable Shape-Shifting Tanuki Masters is an eyewitness to the battle and delights in telling the Tama Tanuki of his exploits, where he was responsible for firing the first critical shot of the battle disguised as one of the mounted archers. In Sukiyaki Western Django (a Japanese remake of the spaghetti Western movie A Fistful of Dollars), this battle is referred to as part of the film's backstory. The battle is also recounted near the beginning of the Usagi Yojimbo story arc Grasscutter. The Japanese anime, Angolmois: Genkō Kassen-ki depicts the battle in a historical flashback and provides an alternative story where the young emperor survived the sea. "In the Middle Age, the last battle between the Genji clan and the Heike clan broke out in Dannoura on 24 March 1185 and Yoshitsune won the battle by using the tides. On the other hand, Emperor Antoku died with three sacred treasures and the Heike clan was ruined." "The battle is the subject of an opera by the Thai-American composer S. P. Somtow. Called Dan no Ura, the opera premiered in Bangkok in 2014." ^ a b c Sansom, George (1958). A History of Japan to 1334. Stanford University Press. pp. 302–303. ISBN 0804705232. ^ Turnbull, Stephen (2003). Fighting Ships of the Far East (2): Japan and Korea AD 612-1639 (1st ed.). Osprey Publishing. pp. 41–42. ISBN 9781841764788. ^ a b Turnbull, Stephen (1998). The Samurai Sourcebook. Cassell & Co. pp. 204–205. ISBN 1854095234. ^ a b The Tales of the Heike. Translated by Burton Watson. Columbia University Press. 2006. pp. 136–140. ISBN 9780231138031. ^ Turnbull, Stephen (1977). The Samurai, A Military History. MacMillan Publishing Co., Inc. pp. 77–81. ISBN 0026205408. This page was last edited on 25 September 2018, at 11:59 (UTC).